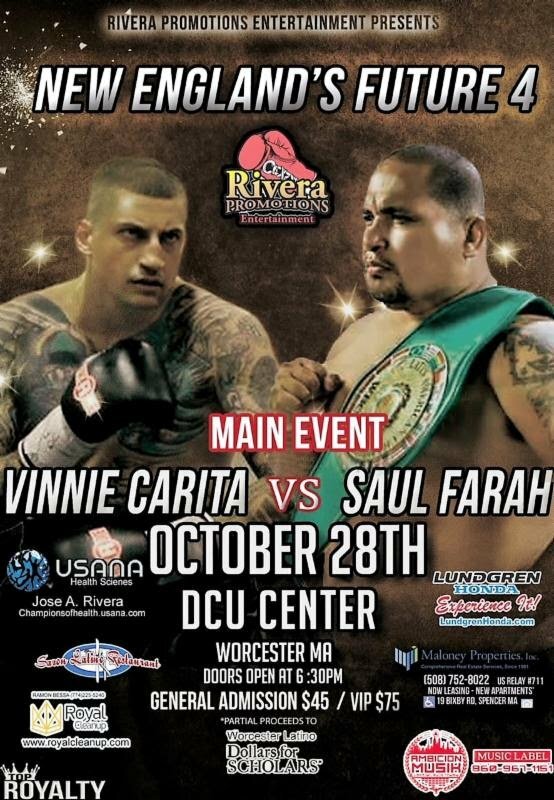 Once-beaten Vinnie “American Dream” Carita is preparing in an entirely different way than all other fighters on the October 28th “New England Future 4” card, the fourth and final 2017 installment of the popular professional boxing series, “New England’s Future”, to be held at the DCU Center (Exhibition Hall) in Worcester, Massachusetts. Carita, fighting out of Pembroke (MA), will move up in weight once again to fight another foreign opponent. In the world of boxing, not only does Carita fight, he’s his own promoter, manager, trainer and matchmaker. Outside of the ring, Carita is a full-time court officer in Brockton (MA), as well as a part-time security contractor for the Department of Defense (DOD).